A&S Bagels, Inc., based out of New York, makes and distributes FROZEN RAW DOUGH BAGELS to bagel shops throughout the country. Bagel shop & bakery owners (and the employees) absolutely love serving authentic New York bagels to their customers. We often hear praises from the bakers in these stores about how great the bagels come out, and how easy it is to work with our dough. 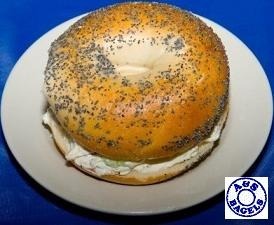 A&S Bagels premium quality raw dough bagels can be delivered to your bagel store. Our raw bagel dough is shipped to your store frozen and ready to be baked after the dough has been proofed at your location. Your bottom line will be effected in a positive manner by the savings you will incur (bagel stores and bakeries can purchase our bagels at wholesale prices). By using the pre-made bagel dough you will save money on ingredients, machinery and labor. By ordering the dough from us, you won’t need a mixer, storage space for the flour, a bagel former and divider. All the while, you will be able to bake off premium gourmet New York Bagels, and serve your customers a great tasting consistent bagel. Moreover, customers will be able to smell the aroma of the freshly baked bagels. This is a perfect solution for bagel shops and bakeries. A&S Bagels have received great acclaim and media attention. CBS and Fox News have taped lived from our retail and baking facilities. We were voted best bagels by the Z-100 Morning Radio Show, and have been mentioned in Newsday and on the Howard Stern Show. (1) The machinery associated with bagel and dough manufacturing can be expensive and can take up valuable space in your bakery. This is eliminated with the use of our raw dough bagels. (2) The baking of the bagels is still done at the store level. This ensures that customers will be able to smell the bagels baking in the oven. (3) Typically a new bagel store using frozen dough will not need to occupy as much space, thus saving on rent costs. (4) Save and conserve your own time, energy and labor. Focus on your customers and/or catering; all the while knowing your bagels are what your customers want. (5) Serve many flavors and different varieties of bagels with ease. Frozen Raw Dough Bagels are used by many bagels stores who want to serve a consistent bagel to their customers without all of the labor of mixing and shaping their own dough. A&S Bagels, makes and provides raw bagel dough pre-shaped as bagels. The raw dough bagels can be purchased at wholesale prices from A&S Bagels. The raw dough bagels are packaged 10 dozen per case. Each case contains 120 pieces of raw dough bagels. It is not necessary to boil the raw dough bagels before baking, however, it is recommended that the raw dough bagels be boiled first in order to be considered a true "New York Style Bagel." The raw dough bagels are made in a variety of flavors. These flavors include jalapeno, whole wheat, sun-dried tomato, french toast, blueberry and more. The raw dough bagels from A&S bagels, Inc. are shipped throughout the country. Legal Notice: By viewing, visiting, using, and/or accessing this web-page and/or web-site, you are bound to certain terms and conditions. You can read said terms and conditions by clicking here. The materials and content on this web-site are protected by copyright. All rights reserved. ©1985-2011.